Don’t you love a snow day? Even though you could choose on any day to be lazy and just stay at home and putter, a snow day gives you permission, absolving you of the guilty feeling a self-imposed lazy day might bring on. I also love the relative quiet that a travel ban brings on. The sound of our and our neighbors’ snow blowers might pepper the air, but no one is out driving around except the snow plows. I have a dog who loves (insists on) walks, so even the winter storm (blizzard?) called Juno didn’t keep us home. With no traffic, we can safely walk down our normally very busy street (it’s actually a state highway) to get to quiet side streets. I find it peaceful to walk in the solitude of a neighborhood where most people are sheltering indoors. My very furry dog Bella is in her element, except for her frustration when mountains of snow prevent us from walking on the unpaved parts of our usual routes. This week’s recipe for French Fridays with Dorie offered the perfect activity for when I was back inside the warm house. I baked a batch of croquants, a meringue-y nut-filled cookie. Calling for just four ingredients, these cookies couldn’t be easier. The nuts are barely chopped. The egg whites don’t even need to be whipped. 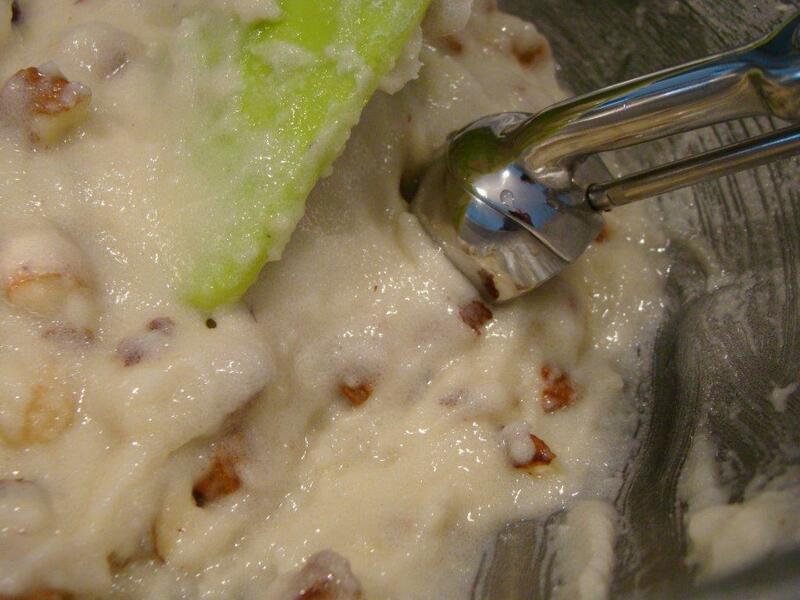 The nuts are tossed with sugar before stirring in the egg whites and then the flour. 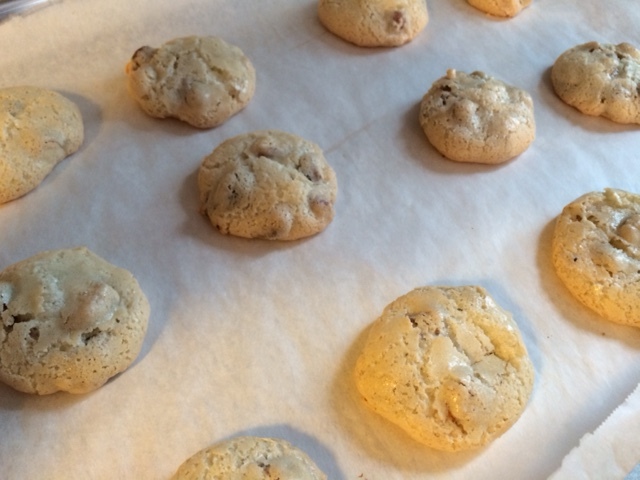 I used my smallest cookie scoop to form small mounds on parchment-lined baking sheets. The croquants puff up and transform into light and slightly chewy delights. I loved the big pieces of nuts glued together with the meringue-like dough. 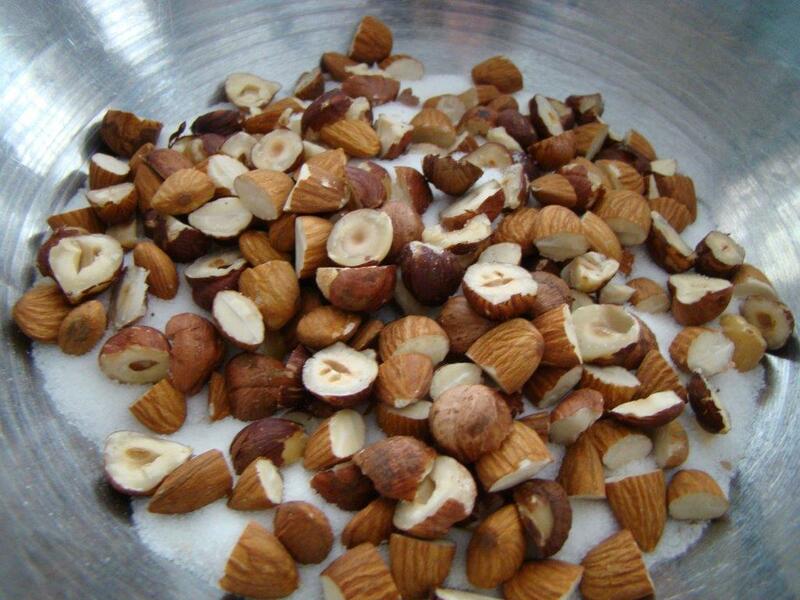 I used a half hazelnuts (cut in half) and almonds (cut in halves or thirds crosswise). I’m intrigued to try the cashews Dorie mentioned as well as pecans and maybe macadamia nuts. So many possibilities! The review from the resident chocoholic was this: “They’re not my top choice (no chocolate), but they are really good cookies”. A backhanded compliment, but praise nonetheless, so I definitely plan on making croquants again! Check out my French Fridays friends’ links at French Fridays with Dorie. We don’t post the recipes, but you can find it in Dorie Greenspan’s book Around My French Table. 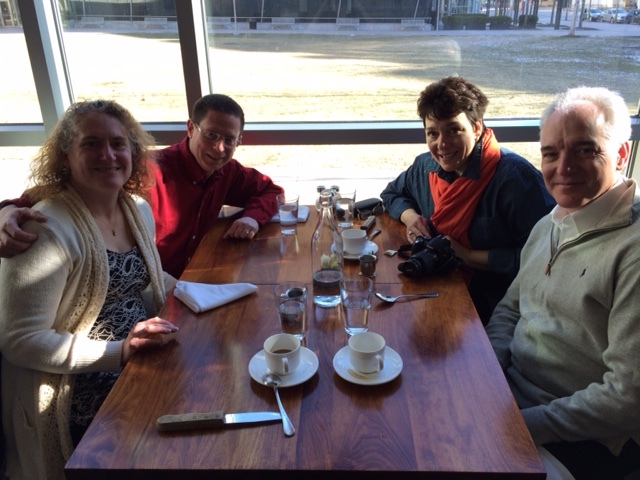 And for anyone who missed it on Facebook, here’s a photo from our breakfast at Area Four with Tricia and Mr. Tricia when they were in town two weekends ago. Posted on 30 January 2015, in Baking, French Fridays with Dorie and tagged cookies, egg whites, French Fridays with Dorie. Bookmark the permalink. 14 Comments. Lovely, lovely post! I miss snow days and I get really disappointed if I miss one of the very few ones up in Sedona. The one that we had (about 8″ a huge storm for us) had the puppies playing in it until they had to come inside to get warmed up and then back out again! Oh the joy!!! I haven’t made these yet. It was an overcast day yesterday and full-on rain today, so I missed my chance for the moment, but I’m excited to make these too! Yours look delicious!!!! At least your chocoholic took a bite! Mine would have needed me to add no nuts and replace them with chocolate :) Wow, you sure DID have a snow day. We have a winter storm watch for the weekend—I’m ready for spring! First, let me say as a doting parent, good picture of all of you. As for the snow, the first thing I think of is to cook/bake. Something about having the oven on, is so comforting. These were good cookies, easy and a great way to use up egg whites and nuts. Have a great weekend. The silence of snow… the slowing of the pace and the dog walks still! I am prepared I have snowshoes for really deep snow and XC skis for lighter falls. Snow days are some of the only days that I actually get inspired to bake, glad you had a good one. What a lovely looking snow day! There were a few snow days out in the suburbs here a few weeks ago, but in Vancouver proper all we got was rain. Now, we’re into an early spring. These are one of my favourites from the book – so easy to make and a great way to use egg whites. I’m intrigued by the idea of chocolate chips with these. I wonder how that would work out? Dear Betsy, so glad we were not the only ones crazy about these lovely French croquants. Their taste also reminded me of a family-favorite cookie I always make, it is called a “Hazelnut kiss”. I love the way your cookies look like and your snow pictures makes me a tad bit envious for some lovely white snow around here! Wishing you and Howard a wonderful weekend – enjoy your walks through the snow, I would love to join you for a long walk if I could…. What a nice break with all of the snow! Your cookies look perfect! I should have used a scoop like your I think. I used chocolate in mine and I liked them but don’t think they needed it. I love snow days, for the very reasons you stated in your post. We didn’t get much snow with this last storm, only about 5 inches. However, you are so right, baking and snow days are perfect together! Loved this chewy, crunchy cookie! Sure to be part of my cookie baking repertoire from now on! Great photo of you and Tricia! I missed it on FB. Looks like you all had a lovely time together. Happy Weekend, Betsy! I have never experienced snow – I have only seen it from a safe distance. At least your dog keeps you fit! These were delish cookies and so easy – would definitely make them again. I would love a winter day in L.A. that would stop traffic for the day. I agree with your resident chocoholic that my preferred dessert would include chocolate but I liked these. I may have to try some with chocolate chips for my son who avoids all nuts. Love the picture of the Mr’s with you and Tricia! I’m with you Betsy! Walking in the snow is one of my favorite things. The combination of everyone being indoors and the way the snow muffles want sound there is feels so cozy and comforting. My little dog, AJ, doesn’t like snow walks!We have to force him outside to even do what must be done:) We don’t get a lot of snow walk opportunities here in Oklahoma. That makes them even more special when we get them. Your cookies look great and I’m thinking of trying half chocolate next time. Maybe some of those mini Hershey chips. 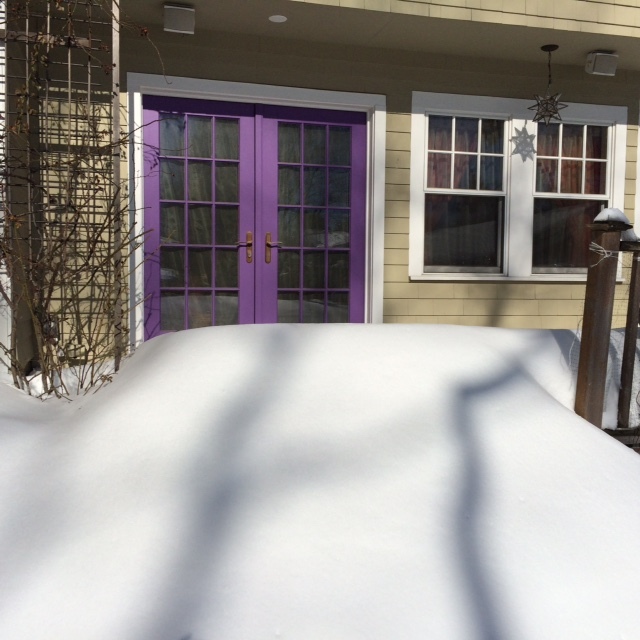 I’m loving all the snowy pictures I’m seeing from friends and family in the US. We rarely get snow worth talking about in Frankfurt and all it take is an inch or so to shut the whole place down. I actually miss it.